Dr. Cotter on Division - RightStart™ Mathematics by Activities for Learning, Inc.
Long division used to be considered the ultimate goal of arithmetic. An earlier division algorithm was so complicated it wasn’t taught until college. Even today some students learn a mnemonic in order to remember what to do next. One example is DMSB (Divide, Multiply, Subtract, Bring down). To make it memorable, some teachers even teach a mnemonic for the mnemonic : Daddy, Mommy, Sister, Brother. Today, there is little reason for students to learn long division to divide by two- or three-digit divisors. They will rarely use it in real life. And no advanced math depends upon learning that antiquated skill. One author suggests long division is taught because it is traditional. Then why don’t we still teach the paper-and-pencil method of finding square roots? Instead, students should learn how to do short division for single-digit divisors, which means the quotient, or answer, is written down without writing any other intermediate calculations. Unfortunately, today many adults never learned short division, even though it appeared in math textbooks in the 1800s. 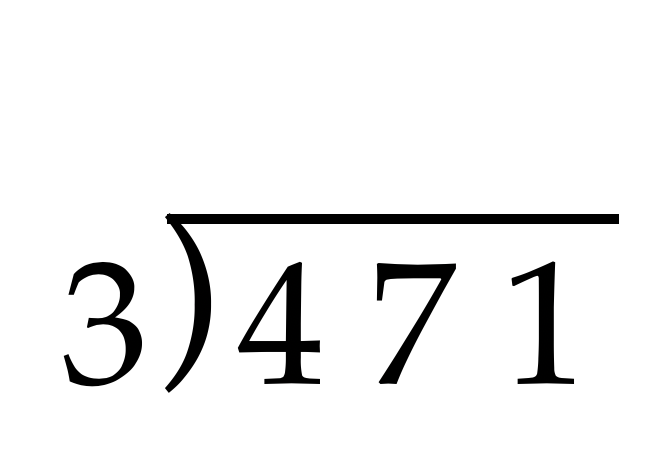 Let’s have a look at a short division example: 471 ÷ 3. Start by dividing the hundreds, 4 hundred divided by 3 is 1 hundred with 1 hundred leftover. Write 1 in the hundreds place for the quotient, the answer. Next divide the tens. Since 100 is 10 tens, we really have 10 + 7, or 17 tens. This is shown with a little 1 before the 7. Dividing 17 tens by 3 gives 5 tens. To find what’s left over, don’t think 3 × 5 = 15 and 17 – 15 is 2. That’s too hard. Rather think, starting at 15, how far to go to 17. The answer is 2 tens, which is 20 ones. Write a little 2 as shown below. Lastly, 21 ones divided by 3 is 7 ones. The quotient is 157. Here is a second example: 8053 ÷ 9. Starting at the thousands place, 8 is less than 9, so skip to 80 hundreds. Then 80 hundreds divided by 9 is 8 hundred. Write 8 in the hundreds place in the quotient. To find what’s leftover, multiply 9 × 8 = 72. Then go up from 72 to 80 hundreds, which is 8 hundred, also known as 80 tens. Add 80 tens to 5 tens, getting 85 tens; show that with a little 8 before 5. Continue by dividing the tens: 85 tens divided by 9 is 9 tens. Find the leftover by going from 81 up to 85 tens, which is 4 tens. Lastly, 43 ones divided by 9 is 4 ones with a remainder of 7. The quotient is 894 r7. After doing a few divisions similar to this example, the student will see the pattern that the leftover is written before the next digit to be divided. Knowing what to do with the remainder is crucial for solving story problems involving division. Find the answers to the following five problems. 1. Thirteen children are going on a field trip. If 4 children can ride in a car, how many cars are needed? 2. Pauline has 13 petunias to plant. She wants exactly 4 in a row. How many rows can she plant? 3. Four children have $13 to split evenly. How much does each one receive? 4. Four children divide 13 candy bars. How much does each one receive? 5. Jack packages 13 cookies with 4 per bag and eats the leftovers. How many does he eat? Notice that the numbers (13 and 4) and the operation (division) are the same for all five problems. But the solutions (4, 3, $3.25, 3 1/4, and 1) are different. Answering these kinds of problems correctly is applying math and takes some thinking. They are also often found on tests. Long division can be taught from the vantage point of short division. Instead of writing the leftover number before the next digit, the next digit is rewritten next to the leftover after subtracting, the bringing down effect. Give the child grid paper to help in aligning columns. The real obstacle in long division is choosing the correct digit for the quotient. For example, in 37 ) 2479, would you think the first digit would be 8 or 7 since 24 ÷ 3 is 8? Well, actually it is 6. It is so frustrating for children to have to erase their incorrect choice — it seems like a mistake — and choose again. Long division is rapidly becoming obsolete and should never be taught to children with learning challenges. If long division is taught, teach short division first because it gives meaning to the traditional long division algorithm. Short division is a very useful skill in mathematics and everyday life. I would like to try your method with a student. It seems interesting. I am wondering about the answer to story problem number 2. Is the answer 3 instead of 5? Hi, Katrina. My name is Rachel. You are correct. We will make the changes as soon as we can.